Two weeks ago, I penned a post on winery stumbling in Niagara featuring, in that post, Sue-Ann Staff Estate Winery. You can read that post here. This is another in the Previously Unexplored Wineries series. One of the great things about wandering in Niagara is the surprise discovery. For me, it’s usually a wine. But on this day, it was a whole winery. Wine communities tend to co-promote. At first glance, it’s counterintuitive. A car dealership doesn’t tell you that you’ll find a great SUV at another dealership, do they? Well, my experience in several wine regions of the world is that wineries are supportive of each other. The effect of cross-pollination of staff, families, and winemakers? They all party together? A small community experiencing symbiotic bliss? Or, maybe they just want you to find what you like and are only too willing to point you in that direction. It’s Miracle on 34th Street Kris Kringle-esque. Let’s hope that doesn’t change. The alternative is a tasting room with shady staff leaning in and whispering, “Hey, dos guys up da road? Dare pinot? It’s cut. Dey cut the pinot with syrah. You can’t trust ’em. Ours is puuure Niagara pinot. Good sh** (wink, wink)” Anyway, where was I? Oh yeah, being referred to Westcott Vineyards. We were tweaked to its very existence by Ted, our personal sip and spit tour guide at Flat Rock Cellars (which I’ll feature later in a post). 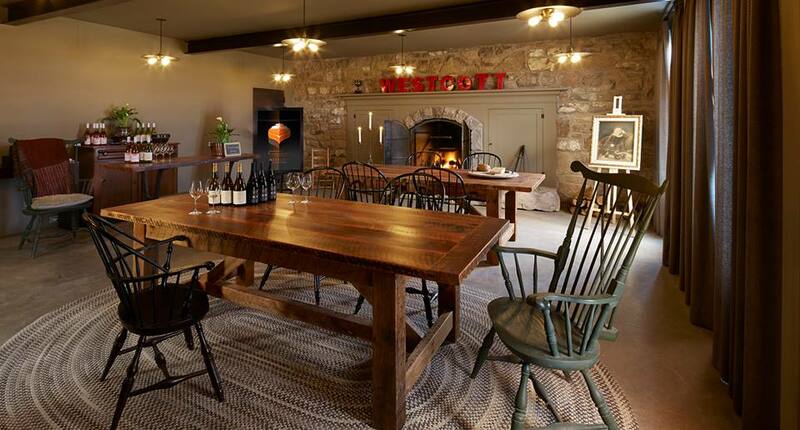 Ted told us that Westcott made mostly pinot noir and chardonnay, both in a pretty assertive style. Umm, who likes assertive chardonnay? So, we had to wander over to Westcott which is in the same neighbourhood as Sue-Ann Staff’s and Flat Rock Cellar – maybe a kilometre away. 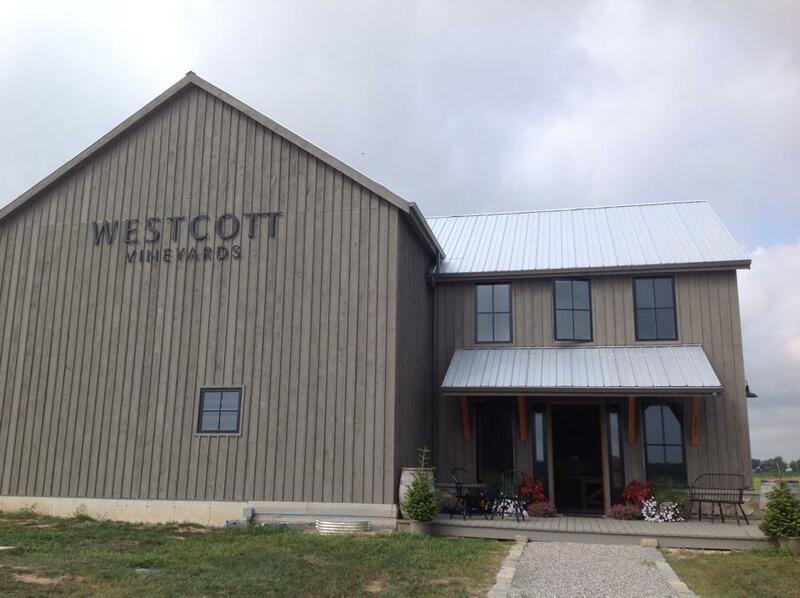 Westcott Vineyards is a family run winery. When we were there Victoria and Garrett Westcott, daughter and son of the owners, were in the tasting room. Well, in fact, they were the only winery reps in the tasting room. What you need to know is that the concept at Westcott is natural, uncomplicated with a bit of rusticity thrown in. The winery and tasting/sales room is in a restored barn (picture above) that we were informed was moved from another location. Long harvest tables made with reclaimed wood and cement floors. It would be quite toasty when the fire is on. And, similarly to Sue-Ann Staff’s, it really presents the wine as agricultural produce not alchemy. I didn’t see farm implements but I had a feeling that they were lurking somewhere not too far away – gravel drive which is de rigeur in Niagara. Their website and personal sales pitch is focused on ‘small’. They don’t make a ton of wine and they allow the vintage to dictate what they can get out of the vineyard. No attempt to make every vintage taste the same. They get winemaking assistance from a Bordelais. Before I get in to the wines I have to mention the boat. Their trademark and many of the references in the names of wines have to do with a restored boat found on the shores of a lake in Quebec at a family cottage, I believe. It has some historical connection to someone famous as well as to the Westcott family but I had already been to three wineries before this and had ditched the pen and paper; so the details escape me. The boat is one of those grand old wood craft that plied the lakes of Muskoka, Quebec and New England during the heydays of cottage and resort development. This one – and I saw pictures – is spectacular! Well, anyway there’s a very important connection to the boat and it’s people. I just can’t remember it. Note to winery webmaster: put a word or two about the boat on winery’s web site. Victoria took us through a tasting. Again, there’s a tasting fee here but refundable with purchase. 2012 Estate Chardonnay $26.00 – Although this wine has had some time in oak (ferment and age) it doesn’t present as oaky in the glass. Lots of apple pie though – classic oaked chardonnay nose. In the mouth, the oak is faint and the apple replays with an assertive finish – a hit of acidity. Some creaminess but not a big chardonnay. Nice sipper for me. Dinner wine for The Director. ABV 13.5%. 2012 Estate Pinot Noir $30.00 – I was expecting this to be one of those big 2000’s California-style pinots after Ted’s claim of assertiveness. But, I was surprised at how restrained it was. Now I find that after a lengthy day tasting, my palate, which is a bit sketchy anyway, gets lazy and maybe I need wines then that are unlike what I’ve been tasting before. So, I question myself when a wine doesn’t translate from swish to sip. But this wasn’t that. This seemed to be asleep, if that makes sense. This wine had some great things going on in the glass (earthiness, bushes, and strawberries) but it didn’t translate in my mouth. This usually means for me that it needs air or time in bottle or both. It, unlike the chardonnay above, carried some heat from the modest ABV of 13.5%. I think that this wine will start to show it’s best stuff in a few years (3 – 5) or two innings of post season baseball in the glass. 2012 Reserve Chardonnay $29.00 – This chardonnay was more serious, maybe austere, than the Estate. It held somewhat the same flavour profile fruit-wise – maybe some tropical notes added – a lot more integration of the oak – more balanced. The oak didn’t so much stand out as simply provide the foundation for the fruit. It was more restrained than I had expected. I would favourably compare this to any other oaked, upper-tier Niagara chardonnay. I noticed on their web site that this has a little less alcohol (13%). Top drawer effort for oaked chardonnay lovers. But in no way did we think it over-shadowed the Estate – just different. We, in fact, purchased the Estate. Maybe because of my pinot noir choice below. Weary wallet syndrome? 2012 Reserve Pinot Noir $46 – I hate it when my favourite wine costs the most. So, why was this my favourite? Well, first of all – the aroma in the glass had pronounced dirty stuff. I love dirty stuff. Oh behave, let me clarify – dirty stuff, for me, as in smelling or tasting like a musty shovel of loam – kind of. I know that most wine geeks would use earthy instead and dirty is not a desirable aroma or flavour, so maybe I’ll switch to that from now on. A friend of mine has told me that he doesn’t fancy pinot noir because of the ‘earthy’ stuff. I love it because of the earthy stuff! This wine delivered more on that earthy nose than the Estate. It opened quickly and had pronounced red fruit in the mouth. It delivered on Ted’s claim that Westcott pinots were assertive. I liked this a lot. Unfortunately for my bank account, they had plenty in stock. I would have opened one of these for Thanksgiving dinner but want to leave them to figure out what they’ll become when they grow up..
Glad Ted gave us the heads up on Westcott Vineyards – a great addition to my Vinemount rotation. Get thee to a winery near you! Images courtesy of the winery. Well I am a Westcott and never heard of you Westcott’s and grew up in the Hamilton. I will be sure to take a run out and meet you…. Good coverage. I’ll have to visit. Shall I tell them you sent me? Sure. It never hurts street cred getting a mention. I really like their take on PN and Chardonnay. Less so on the sparkling and pink. Very nice folks too. Ask them about their symbol – interesting story.